KIEV, Ukraine -- The ceasefire holds uneasily, but tension in eastern Ukraine will still trouble the governments in both Kiev and Moscow. Time for a cigarette break, at least. The war in eastern Ukraine has quietened, for now. Its disparate factions have as much reason to keep fighting as to put away their guns. But a ceasefire signed on September 5th in Minsk is so far mostly holding. Ukraine’s president, Petro Poroshenko, does not want to fight an unwinnable war against Russia, which is the situation he would have been in had he pressed on with Kiev’s “anti-terrorist operation” in the east. His Russian counterpart, Vladimir Putin, is happy to see Donetsk and Luhansk turn into breakaway territories that can serve as instruments against Kiev. From the outset the Kremlin has been advocating a permanent ceasefire, not from humanitarian impulses but because it likes the idea of frozen conflict-zones in the east of Ukraine. The political mood in Kiev spurred Mr Poroshenko to press on as long as Ukrainian forces had momentum. But the incursion by Russian troops with heavy weapons in late August showed that Putin would not allow Kiev a military victory. Without direct NATO aid, Mr Poroshenko felt forced to make a deal. In the short term this will seem like a victory for Moscow. It has a mechanism to influence Ukrainian politics, much as it has in Moldova and Georgia. For as long as the status of Donetsk and Luhansk are undefined Ukraine cannot possibly join NATO. Putin will have noted that his insertion of regular Russian soldiers met criticism but little action from abroad. Barack Obama declined to call it an invasion, but rather “a continuation of what’s been taking place for months now”. The European Union will apply new sanctions next week, but describes them as “reversible”, perhaps to show that it is reluctant to isolate Russia. This week Russia’s Gazprom cut gas supplies to Poland in an effort to stop resupply back to Ukraine. The war has felt distant to most Russians. State television has manipulated its narrative of the conflict to soothe viewers’ feelings of inadequacy and imperial nostalgia, while talking up Western plots and machinations. A poll by the Levada Centre found that 77% of those surveyed said America was the main initiator of Kiev’s operations in the east. The secret burials of Russian paratroopers killed in Ukraine, only to be disavowed by the Russian state, have proved uncomfortable. But compared with the short-lived season of protest three years ago, Russian society seems docile and unthreatening. Another Levada poll found only 8% willing to join protests if they started, against 21% in 2011. Yet Putin’s adventurism and revanchism will create new dangers for his regime. A falling rouble and a Kremlin-imposed ban on food imports from America and Europe means that inflation could hit 8% next year. That may spur a level of social discontent which the war itself has not. Existing sanctions, and the prospect of more to come, are dragging down Russia’s already faltering economy. Morgan Stanley forecasts a recession in 2015. Rosneft, Russia’s biggest oil producer, has asked the government for $40 billion to refinance its debts. Global oil prices have dipped below $100 a barrel, whereas the Russian budget is calibrated to balance at a price between $110 and $117 a barrel. Plugging those holes will be costly. Putin must make awkward choices over what interests to offend. His likely response to economic hardship will be to blame Russia’s enemies abroad for starting a new cold war. In Kiev Mr Poroshenko faces his own difficulties—which may materialise well before Putin’s. He says he will introduce a law next week to create a “special status” for Donetsk and Luhansk. Many questions remain, however: not least, whether Ukraine will manage to regain control over its eastern border with Russia, a decisive factor in assessing if the pro-Russian insurgency can ever be pacified. All sides disagree over how much territory should fall under Mr Poroshenko’s self-rule provision. Kiev sees only areas under rebel control—around a third of the two regions—with this status, but the rebels’ leaders lay claim to the whole of Donetsk and Luhansk. Such issues will weigh on Ukraine’s parliamentary election next month. More immediately, much hinges on whether the ceasefire will keep holding. Mr Poroshenko says that Russia has pulled back 70% of the troops it had inside Ukraine. 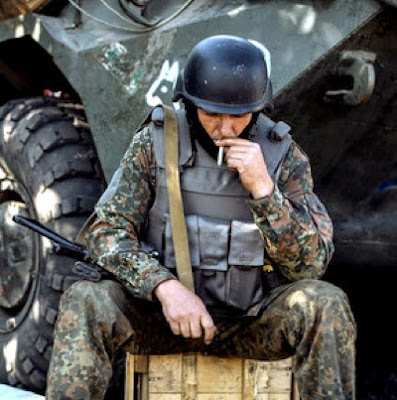 Yet fighting has flared up and then died down in Mariupol, around Donetsk airport and in several other places. At the same time prisoners are being exchanged. A bigger upsurge in violence could easily reignite the entire conflict. On the Ukrainian side of the lines most soldiers appear relaxed, but few believe the ceasefire is anything but a respite. Visiting Mariupol on September 8th, Mr Poroshenko said the war was over and now Ukraine had to win the peace. Rebel leaders still aim to separate from Ukraine. Sergei Baryshnikov, a member of the rebel “parliament”, says a long military and political fight lies ahead. The rebel state of Novorossiya, he says, should eventually comprise all of the Black Sea coast to the borders of Romania and Moldova. And then it will become part of Russia, he adds.